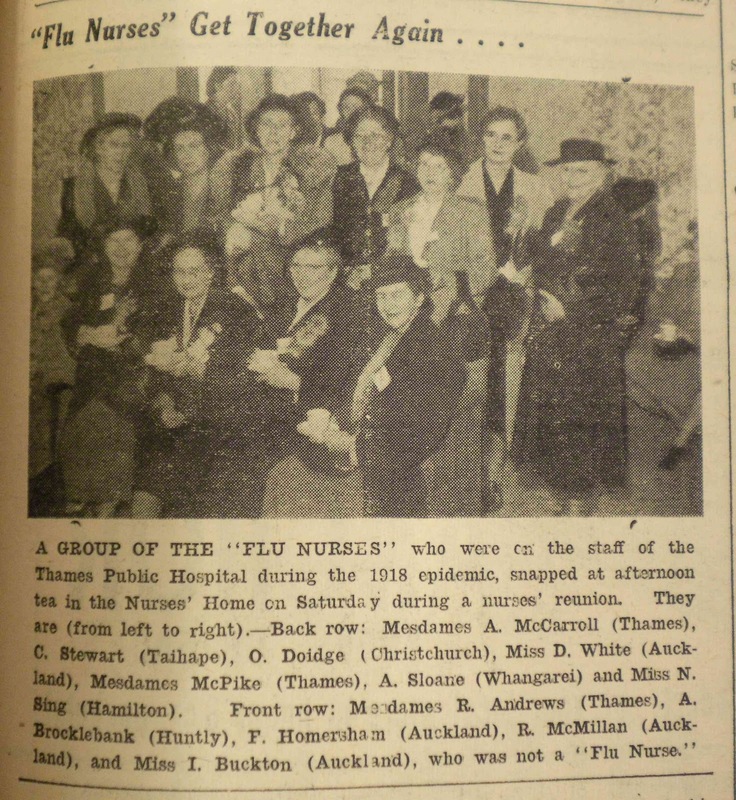 In June 1950 a group of Nurses who had been nurses at Thames Hospital during the 1918 influenza epidemic held a reunion at Thames Hospital. They included: Mesdames A McCarroll, C Stewart, O Doidge, McPike, A Sloane, R Andrews, A Brocklebank, F Homersham, R McMillan. Misses D White and N Sing. 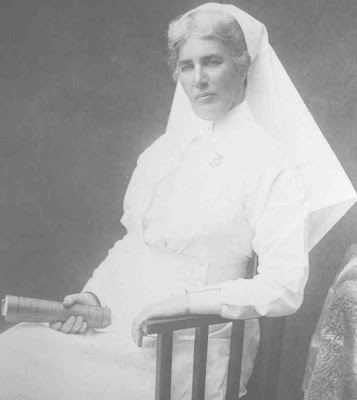 Several nurses who trained or later worked at Thames Hospital, served in World War One. 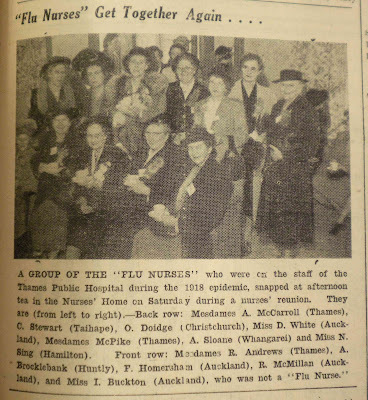 The Treasury now has a list of these nurses and links to further details, including a plaque that was made to commemorate their war efforts. Wonderful lot of information also available at Sherayl's site on NZ Military Nursing history which includes many rolls and other information. Also at Sooty's webpages. One of the nurses, CLARA HAWKINS returned from the war and served as Matron at Thames Hospital 1919-1920, Taking over from Miss Wilson (pictured below). A few other mentions at my Thames pages. An excellent resource for the Hauraki and wider area is available to search at the Auckland Libraries Digital Library. It is called IWIDEX. Iwidex is an index for information on tribal history, tikanga-a-iwi and whakapapa held in the heritage and research collections of Auckland Libraries. It is an easy way to find information about Māori waka, traditions, waiata, haka, tribal whenua, maunga, marae, carving, weaving, stories and whakapapa. An exciting series of lectures are being held at The Treasury during the upcoming heritage Week. Tickets for each lecture are $5, tickets available at The Treasury (which will be open for ticket sales Monday - Saturday 10am to 5pm). Start time for each lecture is 1pm. Two new articles have been added to The Treasury online Journal. This is on my Great, Great Grandfather Clement Augustus Cornes and his family. Specifically a genealogy tale about my hunt for my Great-Grandfather's birth details. 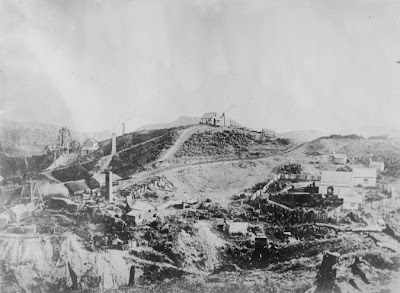 Plus a few details on the Kapanga Mine which he owned for many years. Photograph of the Kapanga area, Coromandel, circa 1860s, with Driving Creek in the foreground. Since the goldfield days there have been many 'heroes' that have been acknowledged for courageous acts of bravery and even more for whom their name has been never recorded and sadly long forgotten. 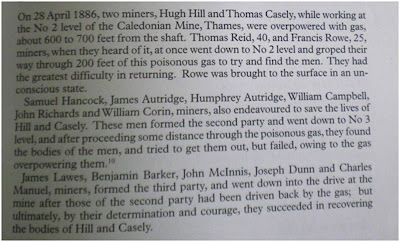 Working in a mine was full of danger and many miners risked their lives to save their fellow worker/s. Many other dangers lurked at the wharves, rivers and coastal waters; where rescues were a somewhat common event. 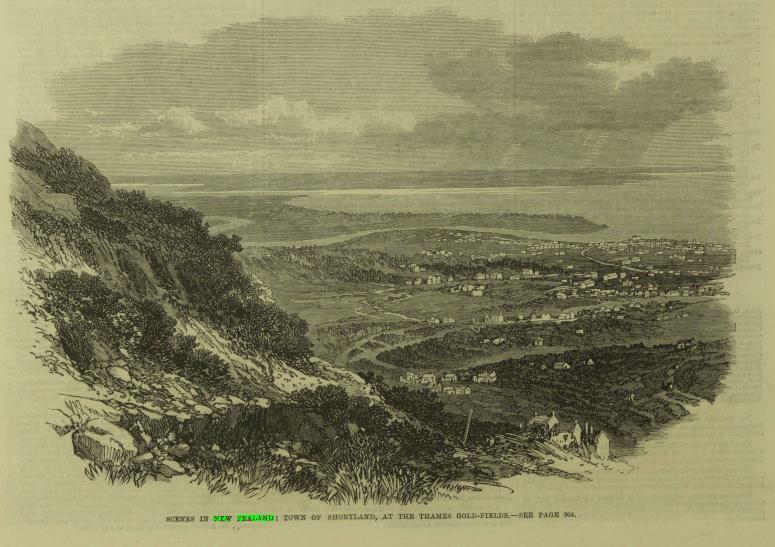 We have record of some of these events in a wonderful publication called "ZEALANDIAS BRAVE, The Royal Humane Societies in New Zealand 1850 - 1998" by John D Wills. The Society has an index online. The Treasury, Thames, has a copy of this book and a file of extra information on the awards applicable to the Coromandel Peninsula area. Many New Zealand libraries hold copies of the book. THOMAS GROAT REID, FRANCIS THOMAS ROWE, SAMUEL HANCOCK, JAMES AUTRIDGE, HUMPHREY AUTRIDGE, WILLIAM CAMPBELL, JOHN RICHARDS, WILLIAM CORIN, JAMES LAWES, BENJAMIN BARKER, JOHN ALEXANDER MCINNIS, JOSEPH DUNN AND CHARLES REUBEN MANUEL. 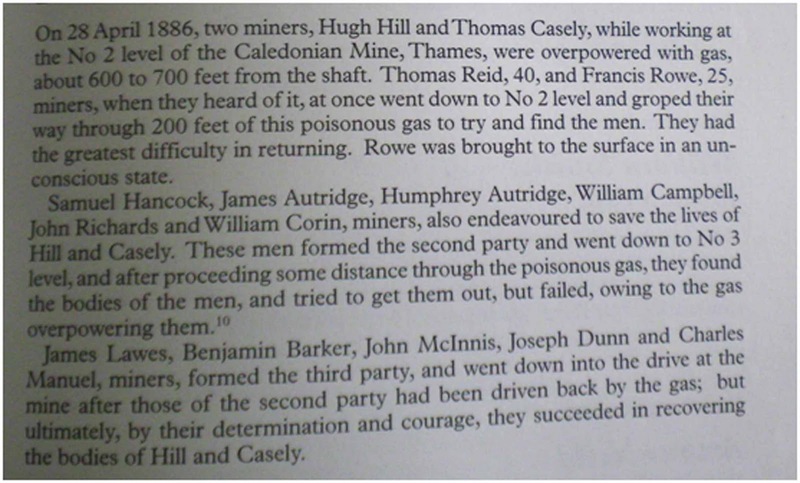 These men went to the aid of HUGH HILL and THOMAS CASELY on 28 April 1886 when they were overpowered by gas in the CALEDONIAN MINE, Thames. Want to know more about the lives of your ancestors who lived in Thames? Well the perfect start is to find time to come to heritage week. A full programme is online - click on the HERITAGE TAB for a full downloadable programme. Historic walks and activities, special gala days and afternoon teas, plus many, many more events. Several heritage events will be held at this venue. 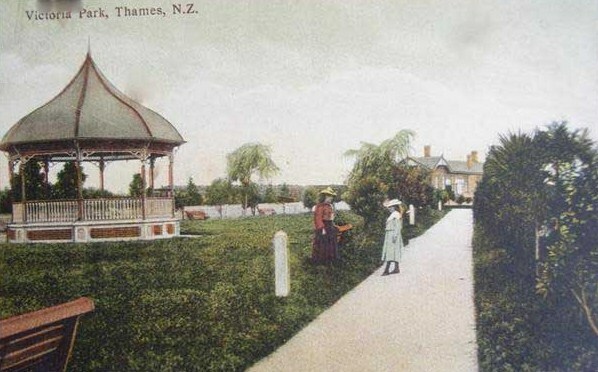 The Croquet Club is now situated where the old Railway Station was - shown here at the end of the footpath.